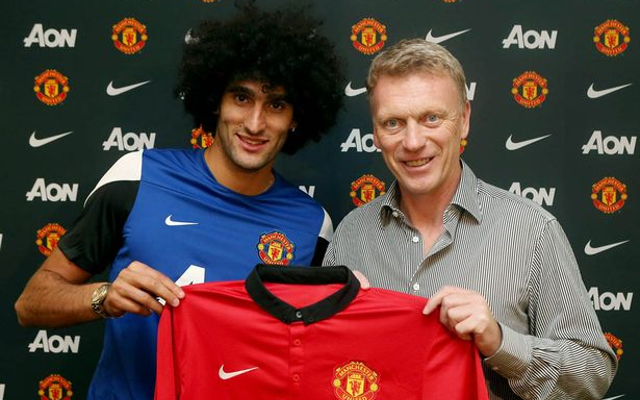 Former Manchester United manager David Moyes has criticised his old club for their transfer policy during his time in charge, insisting it affected views of Marouane Fellaini’s form. The Belgian international midfielder was Moyes’ only signing of note in the summer of 2013, and his struggle to settle instantly at Old Trafford made him something of a scapegoat for the club’s poor form. In the end, Moyes was sacked by the Red Devils the following summer after a terrible season in 2013/14, though Fellaini has since become a key player for the club under new manager Louis van Gaal. The Scot, now in charge of La Liga side Real Sociedad, has said he is pleased to see his former Everton midfielder rediscover his best form, but felt United’s work in the transfer market was one of the problems behind him initially struggling to settle in at the club. Speaking about Fellaini’s form, the 51-year-old told the Daily Express: “We wanted to bring in other players and the recruitment didn’t work the way we wanted it to and, ideally, we wouldn’t have made Fellaini our one and only signing if we could have helped it. “But I am not surprised at Fellaini because I thought he had made a big impact on England over the years. He texts me quite regular and I always text him back and tell him how well he is doing and to keep going. I’m really pleased for him.